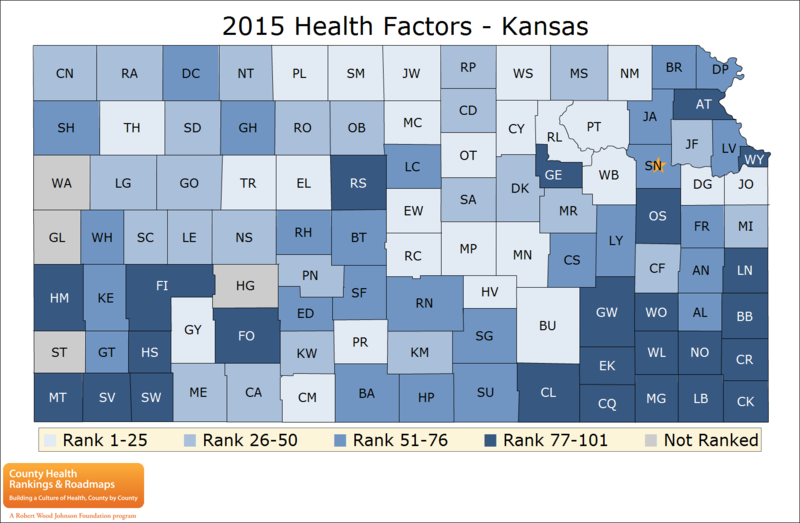 This map shows Kansas counties ranked by health outcomes for 2017. Counties in white rank higher, while darker green counties rank lowest. The two counties at the bottom of Kansas’ health rankings this year share a great deal: high rates of poverty and smoking, and difficulty accessing providers. But the latest rankings suggest the counties might be starting to diverge on one important factor: how likely their residents are to die prematurely. 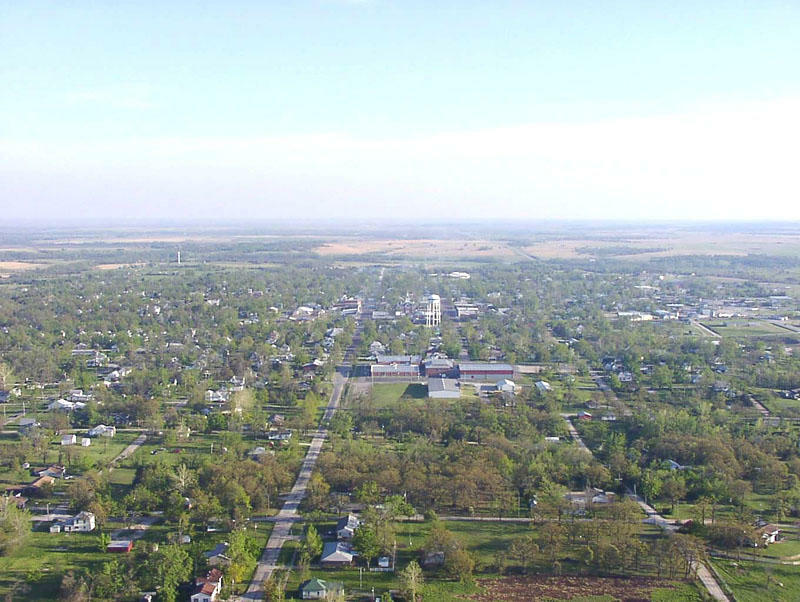 Residents of Labette County in southeast Kansas took the unenviable title of Kansas’ least-healthy people from Wyandotte County in the 2017 County Health Rankings released Wednesday. The annual County Health Rankings, sponsored by the Robert Wood Johnson Foundation and the University of Wisconsin, evaluate counties based on residents’ health outcomes and behaviors. The rankings also consider how access to clinical care, the environment and socioeconomic factors influence health. Download the Kansas 2017 County Health Rankings. Though Wyandotte County scored worse on health behaviors, poverty and residents’ educational attainment, Labette County’s higher rate of premature deaths pulled it down. The rankings show premature deaths in Labette County have slowly increased since 2013, and high mortality among children may be part of the problem, said Gianfranco Pezzino, a senior fellow at the Kansas Health Institute, a nonprofit health policy organization that coordinates the state’s rankings release. Poverty and cultural factors contribute to low health rankings in the region, said Heather Morgan, executive director of Project 17, an organization that attempts to fight poverty in 17 southeastern Kansas counties. Counties in southeast Kansas have clustered near the bottom of the rankings for several years. Many southeast Kansas residents make too much to qualify for Medicaid but can’t afford private health insurance, Morgan said. While southeast Kansas health rankings have yet to improve, groups have formed to tackle the issue, Morgan said. County health departments, local hospitals and the University of Kansas have partnered to work on improving residents’ health, she said. “Those aren’t things that can be changed overnight,” she said. Pollution from the region’s industrial past also is an issue, Pezzino said, as is the damage to communities’ social fabric when blue-collar jobs started to disappear. Counties can’t expect major changes in their health rankings over short periods of time, Pezzino said. Communities can improve their residents’ health by reducing poverty and improving high school graduation rates, but it takes a long-term commitment and many partners, he said. While Wyandotte County continued to score poorly on health measures, particularly in comparison to neighboring Johnson County, its leaders saw reason for optimism. Johnson County, which is substantially more affluent, ranked first in health outcomes. Premature deaths have declined in Wyandotte County, though they are higher than the statewide average. The same pattern appears in the rates of teen births, preventable hospital stays and residents who are uninsured or unemployed: still high, but steadily decreasing. Cathy Harding, chair of Healthy Communities Wyandotte’s steering committee, said the county can point to some successes. Enroll Wyandotte helped increase the number of residents with insurance and walking clubs have encouraged physical activity, she said. The health committee also has worked with public schools and the Wyandotte Economic Development Council to help train residents for higher-paying jobs, Harding said. Mark Holland, mayor and CEO of the Unified Government of Wyandotte County, said the county has tried to grab “low-hanging fruit,” such as raising the age to purchase tobacco to deter teens from smoking. But reducing the number of unemployed adults and children in poverty is the key to improving residents’ health long-term, he said. County leaders need to keep people working on improving health from getting discouraged by the overall rankings, Holland said. Seeing improvement on some measures helps, he said. “Even though it’s not going to improve our health rankings, it’s still improving life for people in Kansas City, Kansas,” he said. A similar dynamic played out on the opposite side of the state line. Platte County, which contains some more affluent suburbs of the Kansas City area, was ranked the healthiest county in Missouri. Jackson County, which includes the core of Kansas City, Mo., came in 61st out of 115 counties. The top five counties in Kansas were Johnson, Wabaunsee, Pottawatomie, Logan and Riley. The bottom five were Wilson, Osborne, Republic, Wyandotte and Labette. A cluster of counties in southeast Kansas are among the least healthy in the state, according to new rankings released Wednesday. Four of the five state’s unhealthiest counties — Woodson, Cherokee, Greenwood and Labette — are in southeast Kansas. Several other counties in the region rank among the bottom 10. But the director of an initiative launched in 2011 to address the underlying causes of the region’s health and economic problems said progress is being made. 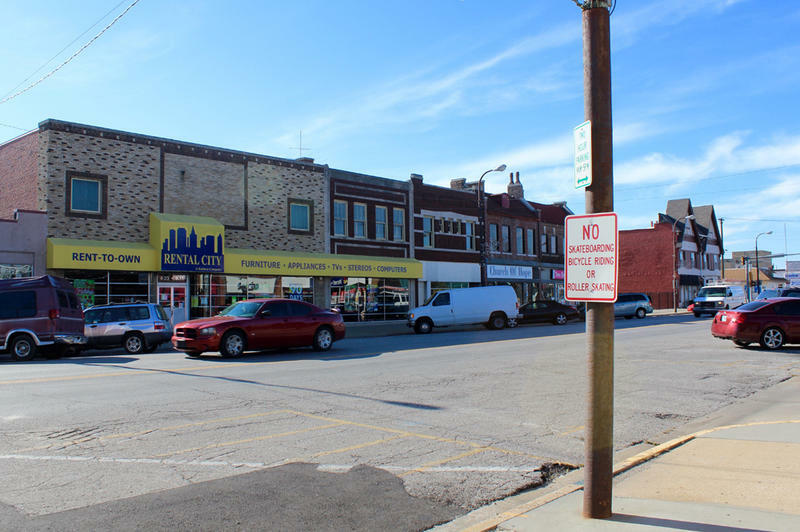 Wyandotte and Johnson counties, despite being across the street from one another, are worlds apart when it comes to health. On this edition of Up To Date, we explore the issues each county faces and why there is such a large discrepancy when it comes to healthcare for residents. It isn’t far from the gleaming bank buildings and high-end hotels to the rent-to-own stores and corner shops that stock more chips than fruit. A visitor getting off the highway in downtown Kansas City, Kansas, would pass by a Hilton Garden Inn and several high-rise buildings bearing the names of financial companies.